1.5m Display Port Cable for DisplayPort connections. 1.5m display port cable for transferring high-bandwidth, uncompressed digital video, multi-channel digital audio and control functions. DisplayPort 1.1a HD 1080p compatible. 10m DVI Extension Cable, DVI-I Dual Link. 10m DVI extension cable, can be used to extend DVI-D or DVI-I DVI cables. 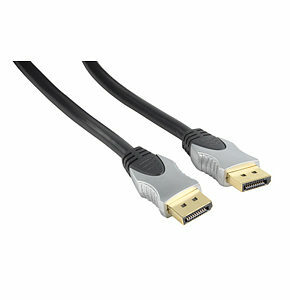 Male to female DVI monitor extension cable. DVI-I male 24+5 29 pin connector to DVI female 24+5 29 pin. Gold plated pins with nickel plated shell. Ferrite supressors for RFI rejection. Colour black. Length 10m Please note that the male end of a DVI-I extension cable will only plug into a DVI-I socket, the cable can be used to extend DVI-D or DVI-I cables.